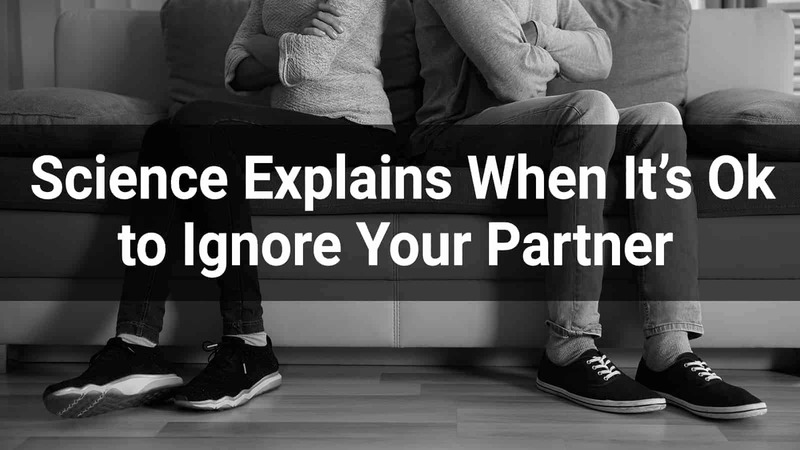 Is ignoring your partner completely wrong? Is avoidance or withdrawal from your partner always an indication that there’s trouble in your relationship? Relationship gurus have always stressed the importance of communication in a relationship. We’ve been told that for partnerships to work, couples must always open up and face their problems together. But a study published in the Journal of Personality and Social Psychology cited that there’s an exception to this rule. It turns out that, sometimes, ignoring your partner is actually OK and that withdrawing from your significant other may actually lead to greater satisfaction in life. Experts from the American Psychological Association visited 1,000 couples for this study over the course of 18 months. The participants willingly discussed their problems and the things they hoped to change in their relationship. The researchers studied the dynamics of the couples and saw a familiar demand-withdraw pattern. This usually happens when one partner asks for something, while the other partner ignores the demands. Traditionally, the demand-withdraw pattern gives rise to conflicts in a relationship. This behavior is often linked to high dissatisfaction when pressure and blaming come into play. But surprisingly, the demand-withdraw pattern did not have such an unfavorable impact on the relationships of low-income couples compared to those who were better off economically and socially. The findings revealed that the relationship satisfaction of more affluent couples dwindled when there were too many demand-withdraw interactions. On the other hand, the relationship satisfaction of economically and socially disadvantaged couples was more stable despite the demand-withdraw interactions. But when the low-income earning husband did not ignore his wife, that’s where the dissatisfaction rated lower. Study lead author Jaclyn M. Ross explained the implications of their findings in the press release. She confirmed that the dynamics of a demand-withdraw pattern can work differently for couples, thus shunning long-held beliefs that this pattern is distressing for every relationship. Ross cited an example where a wife demands that her husband should ask his boss for a raise. A husband with a low income might be reluctant to do it, knowing there are risks. Instead, he withdraws from his wife. In the process of ignoring her, however, the husband protects his self-esteem, as well as the vulnerability of their situation. In this case, ignoring the wife was more positive for the relationship. But if a husband earned more and was in a better position to ask for a raise, ignoring his wife’s demand could be seen as an unwillingness to make his family’s life better. This can easily draw friction and increase the wife’s dissatisfaction and displeasure toward her husband. While it might seem easier for well-to-do couples to fix their problems because they have the resources, their higher status can also lead to high expectations. So, if those are not met, then conflicts in the relationship can develop or worsen existing problems. Ross emphasized that because low-income couples have realistic expectations of their situation, the demand-withdraw pattern makes less of an impact. Couples in a socially disadvantaged situation are more aware that their problems in life go deeper than what they can control. So, if changing their situation might not be possible, then disengaging becomes not only a healthier response but also a necessity. Being in a relationship is a lot of work. As much as you love your partner, you do have episodes where you just wish he’d leave you alone. Despite the importance of communication in a relationship, there are times when ignoring your partner is actually OK as the above study demonstrated. But here are a few more ways to withdraw from your partner while still working to forge a positive relationship. It’s best to disengage and give your partner some space when he’s in a bad mood. It will be difficult to have a proper conversation with someone who is angry. Just ignore your partner until his negative mood has subsided. In the same manner, if you’re the one who is angry, you should let off steam away from your partner. This is a positive way to avoid a fight that might not even have something to do with your relationship. For example, your husband comes home after a bad day at work. Because he’s a bit stressed and sensitive, he could overreact with anything you do or say. If you start defending yourself by answering back sharply, a full-blown fight might spark between the two of you. Sometimes, your partner might try to bait you into an argument as his way of unloading his frustrations. Understand that when a person is stressed and angry, there may be no logic to his feelings. Don’t take these comments personally. If he senses you’re not up for engaging in an argument, he’ll likely leave you alone. But avoiding your partner so that you won’t fight is only a short-term solution. It shouldn’t be something you do over and over because it’s not a healthy coping mechanism for your relationship. When he’s calmer and no longer temperamental, make sure that you sit down with him and talk about what’s really going on at work. Nobody is perfect and that’s the universal truth. There are things about your partner that will continue to annoy you and he will likely get annoyed about some of your bad habits, too. But if you let every single imperfection get to you, then you’re never going to truly live harmoniously with your partner. So, in some cases, it is better to ignore the bad habits and just let things be. Despite what people say, it’s not always easy to change those bad habits. When something has been ingrained in your husband since childhood, you might need to accept that he will never change some of his ways. For instance, your partner tends to forget to turn the lights off when he leaves the room. You’ve told him a hundred times to stop being wasteful but he still keeps doing this. Instead of scolding him, consider ignoring the habit altogether. Don’t be like his mother, who probably also nagged about turning off the lights. It’s not a personal attack on you if he forgets to do something you’ve reminded him about multiple times. He’s not doing this to be disrespectful or to devalue you. It’s really just a bad habit he cannot shake off anymore. Sometimes, you need to overlook some of his flaws and not let it upset you. If it’s not directly affecting your relationship, there really is no harm in shrugging it off. “Don’t go to bed angry” is what they say. You may have heard this age-old advice many times before. The idea behind this advice is that couples should foster positive thoughts and not negative memories. Therefore, they should settle their fights before sleeping. But a study found in the Journal of International Society of Psychoneuroendocrinology revealed that it might be better to ignore your partner than to engage in an argument before bed. You’ll do your health a favor because, apparently, fighting before bedtime can lead to sleep deprivation. This, in turn, can raise your risk for high blood pressure, cardiovascular diseases, arthritis, and diabetes. Experts followed 43 married couples in this experiment and studied their blood samples before going to bed. When an argument struck, the scientists took more blood samples after the fight to analyze if there were differences. Their findings showed that couples who were sleep-deprived, because they had to settle a fight the night before, had more indicators of inflammation in their body. If you make a habit of never going to bed angry, at the cost of sleep due to settling an argument, you’ll likely have a high level of inflammation. Inflammation is a precursor for many types of diseases. The study has raised a red flag against the idea that you must settle an argument before you sleep. Worse, couples who try to settle a fight but lose sleep over it often end up arguing again the following day (or night). And it’s likely because their sleep deprivation made them short-tempered. It seems marital conflict and short sleep do not make for a good combination, health-wise. So, if you’d rather get a good shut-eye than engage in an argument with your partner, then go ahead and ignore him for the time being. Sometimes, being upfront is a more mature way of handling a situation that could get stressful and tense. So, if you need to avoid your husband, perhaps it will be better to tell him this in a direct but polite manner. 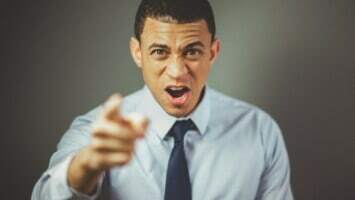 In some relationships, couples call a time-out when they are angry at their partner but they don’t want to make the situation worse than it is. Usually, the couples aren’t on speaking terms because they are still processing their anger. In such cases, it helps if they make their intentions of avoiding each other known. For example, if you don’t want to be in the dining room with your husband for dinner you can politely announce that you would rather have your meal in the bedroom. This isn’t a manipulative tactic if you’ve both agreed beforehand that this how you handle your anger when one of you is not yet ready to sit down and talk. It comes with a great deal of respect if couples agree to this term because you never have to use the destructive silent treatment. It still shows good manner and maturity even if you’re raging in anger deep inside. Even if there are positive ways to ignore your husband, it doesn’t erase the fact that there are issues that you have to address in your relationship. So, after you’ve had your space for a day or two, the next step would be to communicate. It will also help your relationship if you don’t ignore the good things you see or feel in regards to your partner. Express your gratitude and affection for your partner every chance you get. These moments will keep re-invigorating your love for each other.